“Champagne to Cathedral”! 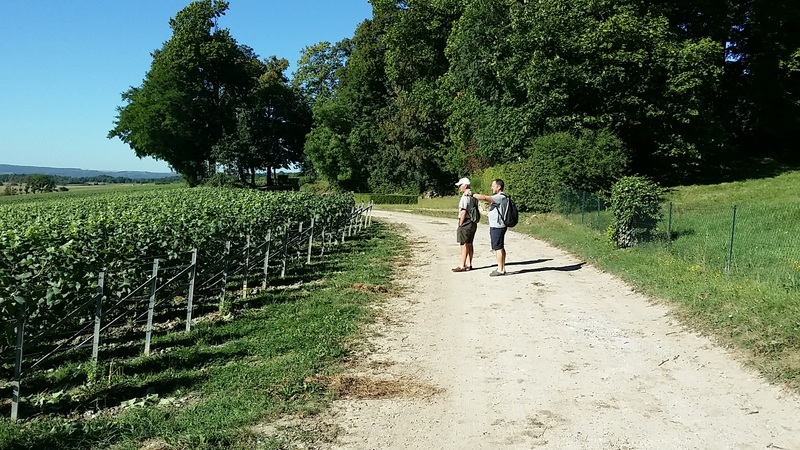 After a few days of silence from the team (due to lack of Wi-Fi access), a gloriously sunny day started in the Champagne fields of Veuve Clicquot with Marty and Robbie walking slower than usual taking in the sights! In the meantime Father Giles and Brother Michael set off in pursuit of places to stay and officials to inform. Unfortunately a puncture delayed their progress, but help was soon on the scene when a passing motorist pulled up. Surprised to see two British monks emerging from the car he asked what they were up to. 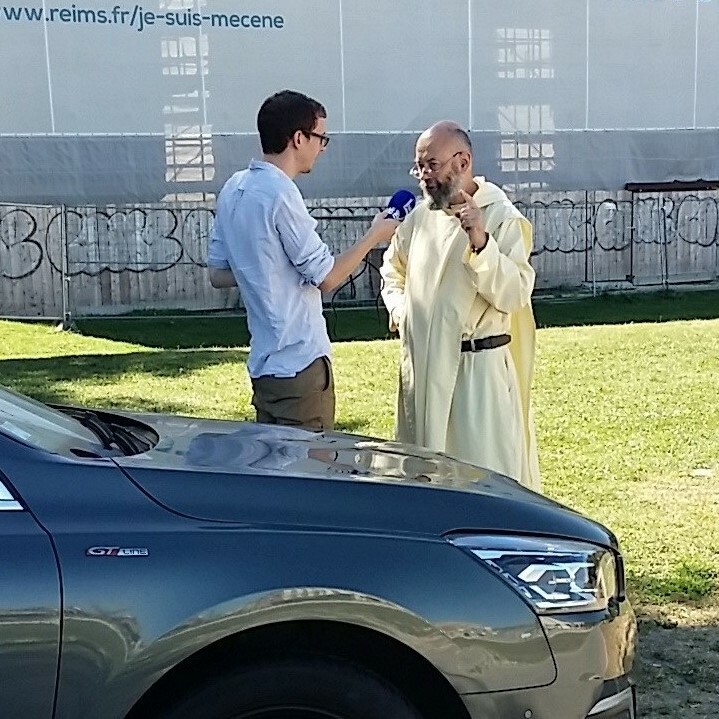 A drama soon turned out to be a blessing as the young man turned out to be from Radio Reims and immediately his microphone was in front of Father Giles who gave an enthusiastic interview in French! 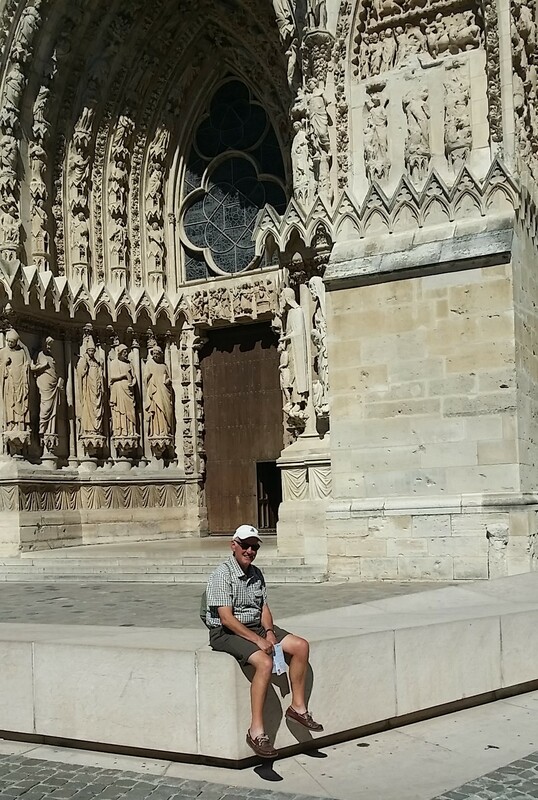 All met up later in the day at Reims Cathedral, an impressive 13th Century Gothic building. “The three porches are adorned with skilfully sculptured figures and animals bringing the biblical scenes to life. Its craftsmanship is all-encompassing, a sight that once seen is engraved in one’s memory as if the sculptor had somehow carved it” – Alice Warrender from her book “An accidental jubilee”.